Most private and public lands in the northern New York deer hunting area have hunt-able deer populations. During the last few years more hunters in this area has resulted in significant pressure on private as well as public land. Unlike 10 years ago when few lands were posted, most private land is now posted. That private land that is not posted is heavily hunted. 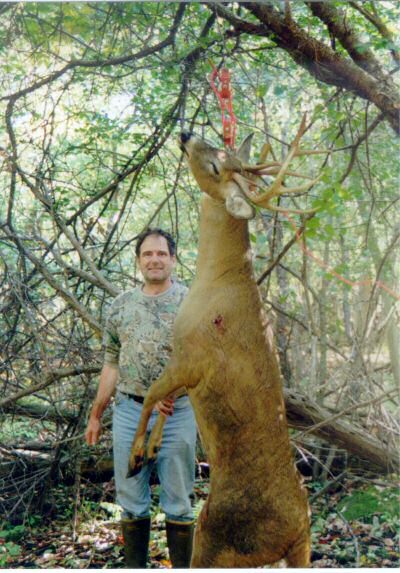 Most landowners deer hunt their land or have children, relatives, family, or farm help that hunt deer. A very few do not. Checking for deer hunting permission long before the season begins is necessary. There is a lot of public land open in New York to deer hunting but public land which was pretty much ignored in this area is now hunted hard compared to three years ago. Still, some of the areas large deer are shot on the public lands. The two major categories of public land available to deer hunt in New York are wildlife management areas (WMA) and state forests. This area has 18,908 acres of New York state land open to deer hunting in WMAs. Nearby there are also 10,126 acres of New York State forests open to deer hunting. The New York state lands open to deer hunting contain some of the largest, thickest, nastiest swamps and thickets around. It is in these areas that big whitetail bucks chase does in during daylight while staying hidden. Mature bucks require many square miles as their home area. The bucks feed and hide in private and public land. Whether hunting private land or public land you are hunting the same individual super smart animals. New York deer hunting season is still very generous. 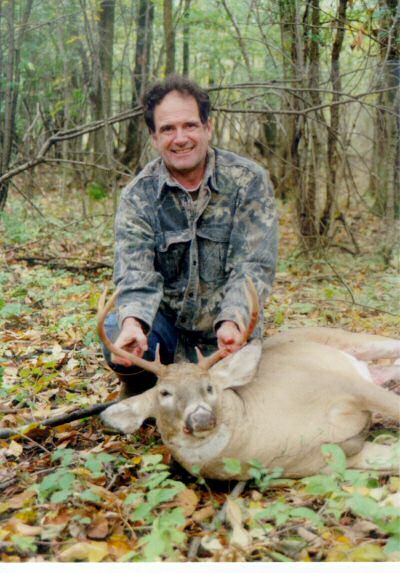 If one hunts archery, muzzleloader, and rifle season in the northern zones, he or she can deer hunt the New York northern zone from September 27th until about December 11! I have hunted in many states but when it comes to deer hunting I can still say " I love New York". Anne and I took these deer during the 2000-2005 NY deer hunting seasons. 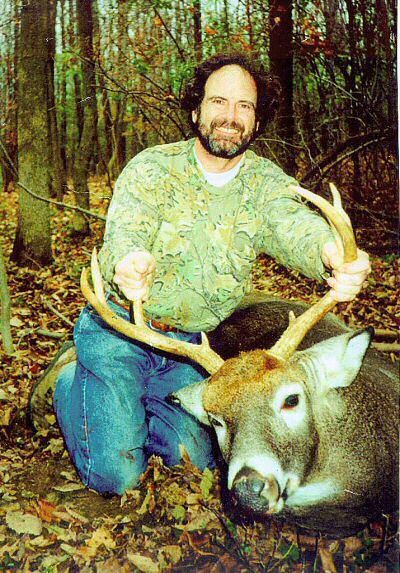 The deer pictured on this page are the best deer Anne and I have taken and are representative of the better size deer taken in this area though we have seen bucks taken locally that were larger. 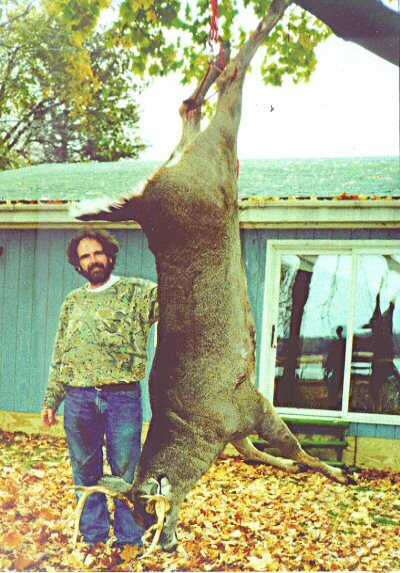 The deer pictured ranged in dressed weight from 168 lbs. to 217 1/2 lbs. None of these deer came easy but it does show what is possible in this area when QUALITY DEER MANAGEMENT principles are applied when hunting deer in New York. Every year more and more people are following Quality Deer Management principles. Imagine the possibilities if everyone followed QDM? Archery hunting in a word is .....Superb..... and I say superb because of the numerous opportunities to shoot. Archery is difficult and most of us archers are happy to harvest either a mature buck or a management doe. Because of a good deer population here and because archery season is the first of the hunting seasons the deer are fairly daytime active. 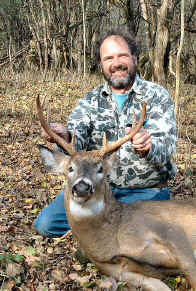 It is not uncommon to see a few or more deer go by your stand in a two hour morning or afternoon hunt. Mostly these will be does with an occasional young buck. The more mature bucks are not often daytime active at this point, but can be. 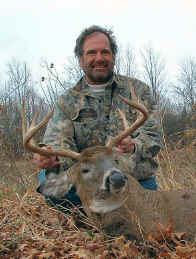 Deer hunting during the New York archery season is predictable because the deer are in a heavy feeding pattern. In the woods the deer feed on acorns, hickory nuts, beechnuts, and apples. In the fields they feed on clover and alfalfa. The northern New York deer hunting early muzzle-loading season follows archery season and to me is the most fun. It is a great time to be in the woods deer hunting. It is only one week in October and the weather can be beautiful. Though it is usually warm, the deer are still on a very active feeding pattern. The area that we hunt now allows us to shoot bucks or does but we use the NY state muzzle loading deer hunting season as an opportunity to do our part in trimming the doe population. It is a lot easier to pass on immature bucks during rifle season when you have a nice doe in the freezer! 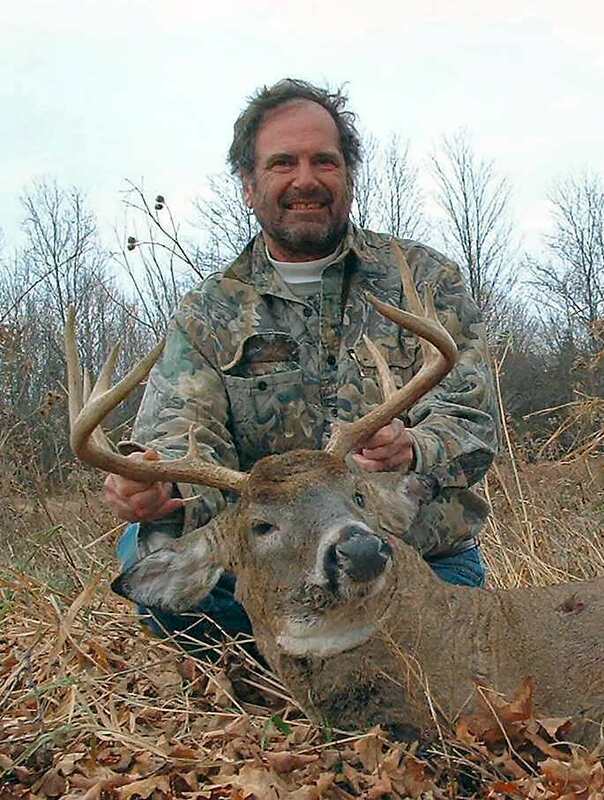 New York deer hunting early muzzle-loading season is the best time to introduce young or new hunters to deer hunting because many deer are seen up close and shooting opportunities are plentiful. Also, the woods are alive with wildlife activity. If you are quiet and still, it's amazing how you can become a part of the woods backdrop and easily spy on the inhabitants. We've seen gray fox hunting, fisher cats chasing squirrels, and partridge rustling through the leaves. Several times we've been surprised by a hawk zipping between trees chasing prey. On one of my better days (I was sitting pretty still) a flock of turkeys came by and one almost stepped on my foot! Not only is there action, there is sound. The honking of mile high geese is a reminder that winter is coming. A coyote howling gives you goose bumps. The incessant chatter of a red squirrel gives you something else to focus on when not much is happening. And the STOMP and the BLOW lets you know "you're busted." There is a late muzzle-loading season which is about the 2nd week of December. It can be quite cold. The deer are pretty educated by then, but if the weather is reasonable hunting can be good. 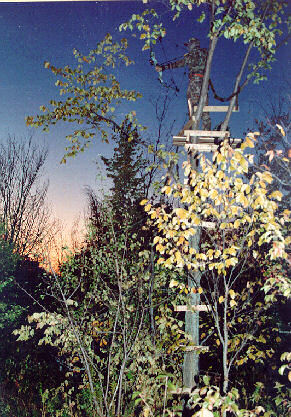 In 2005 the December weather was tolerable and the deer moved real well almost every afternoon. 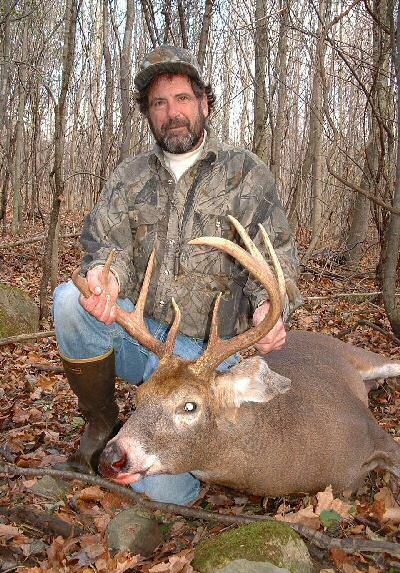 Try New York deer hunting during muzzle-loading season, it's SUPERB! New York deer hunting rifle season typically opens the 3rd Saturday in October, the day after the end of muzzle-loading season. The pressure of bow hunting, muzzle-loading and wild turkey hunting seasons shows in reduced deer activity. No longer do you see fields of grazing deer on an early morning or late evening drive. Still opening day of rifle deer season does account for many bucks being taken, mostly 1½ year olds not every deer hunter appreciates the benefits of letting the young bucks "walk"). 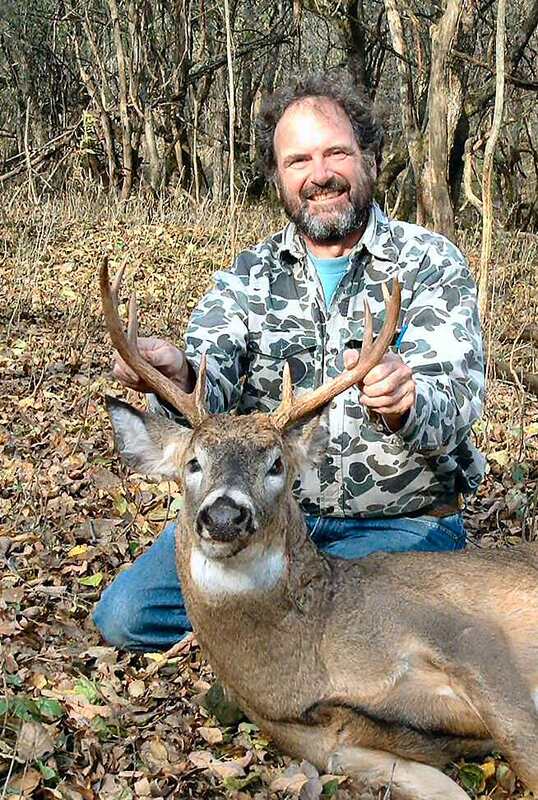 The pressure of opening weekend deer hunting, combined with the normal October lull, makes much of the remainder of October quite uneventful when hunting for bucks. Even though the coming rut will get them moving, expect a challenge because the deer have definitely passed 'hunter recognition 101' by this time. They know where all the hunters' favorite stands are located. Sometime in late October deer movement begins to pick up. Now more rubs and scrapes appear daily. The rut kicks in and deer hunting action steps up a notch. 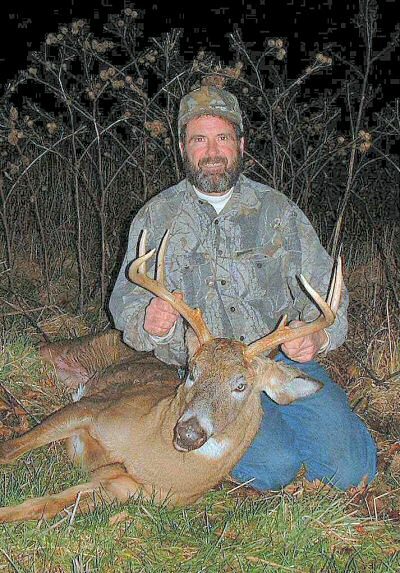 Many of the largest bucks are taken around November 10. Always a giant buck or two is taken after November 10 right through rifle seasons end. It is near the end of deer hunting season that the giant deer of state parks, large closed off private properties and hard to hunt areas do most of their long range roaming in search of estrous does. New York deer hunting during rifle season is full of surprises and once in a while unbelievable action.